With high ceilings and rustic oak beams, this converted 17th-century coach house is one gorgeous holiday apartment. The studio has an open-plan layout and is surrounded by five acres of woodland. The apartment’s windows overlook the shallow banks of the river Poulter. As you step into the flat, you’ll immediately enter the kitchen. The kitchen is attached from the bedroom/lounge area and features long counter tops, fridge and an antique wooden storage unit. There are 2 oven hobs and a microwave oven in the kitchen. There’s also a four-person dining table, where you can enjoy your evening meal. The bathroom is between the kitchen and the bedroom/lounge area. 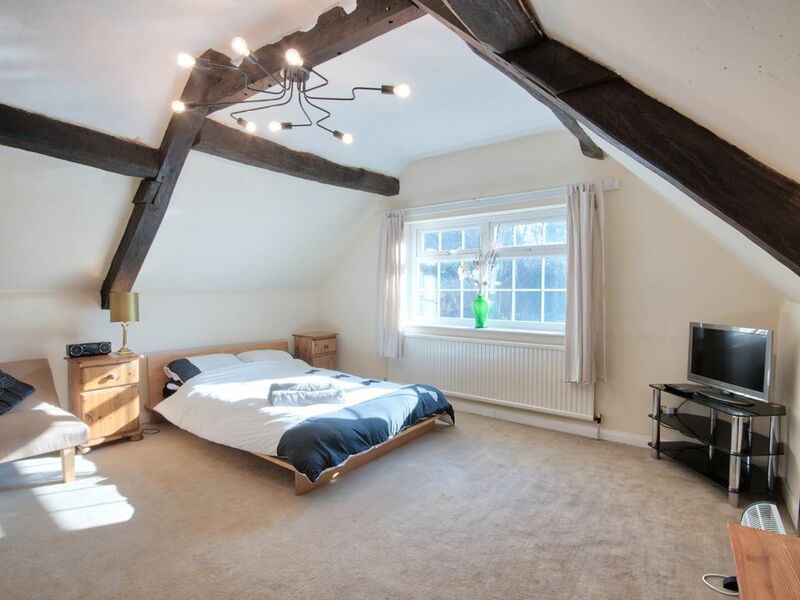 The expansive, open-plan lounge and bedroom has high ceilings with beautiful oak beams. A large futon serves as a comfortable bed for two. This space also has a TV, a wooden chest of drawers, a wardrobe, and a sofa. Located in the quaint market town of Retford, this 17th-century coach house sits on five acres of woodland -- perfect for leisurely nature walks or spending time outdoors. Guests can also enjoy an outdoor patio area, shared garden and onsite parking.